overall an escutcheon Gules three zules Argent [normally displayed with a label of three points in chief] (for Zuylestein). Supporters: Two lions erminois ducally crowned Azure. 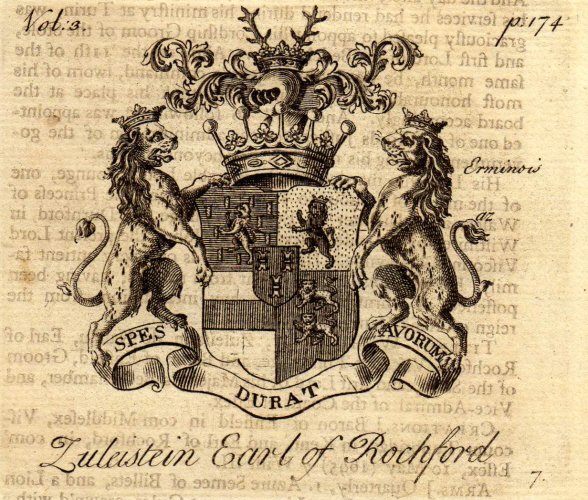 William Nassau de Zuylestein, one of the most trusted companions of his kinsman William of Orange, was created Earl of Rochford and Viscount Tunbridge in 1695 (both in the Peerage of England). He was succeeded by his son William, the second Earl, who was killed at the Battle of Almenar, and then by another son, Frederick, the third Earl. Frederick’s son, William Henry, the 4th Earl, was a diplomat and a statesman. Having gained experience as envoy at Turin from 1749 to 1753, he was Ambassador to Madrid from 1763 to 1766 and to Paris from 1766 to 1768. From 1768 to 1775 he was one of the secretaries of state. He left no children when he died on 28 September 1781, and was succeeded by his nephew, William Henry, the 5th Earl. The titles became extinct on the latter’s death in September 1830. Arms: Or a bend cottised Sable. Crest: A castle Argent tripled towered with a demi-lion Gules issuing out of the middle tower. Supporters: Two angles proper the habit and wings displayed Or. 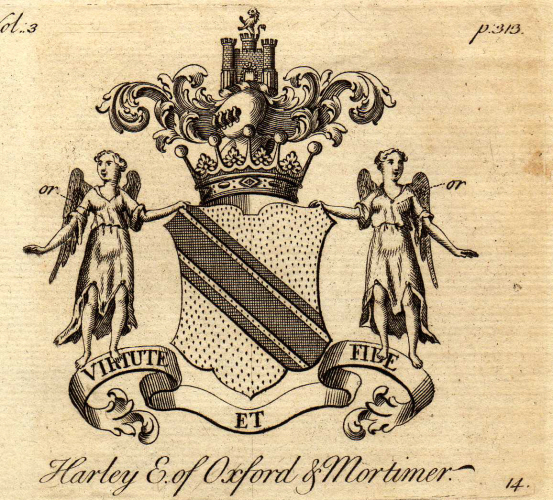 Robert Harley was created Baron of Wigmore, Earl of Oxford and Earl Mortimer by Letters Patent in 1711, with a special remainder, failing heirs male of his body, to those of his grandfather, Sir Robert Harley KB. Robert died in 1724 and his only son, Edward, died in 1741 without male issue when the titles passed to a cousin. The titles became extinct in 1853 following the death of the 6th Earl. Arms: Azure a chevron between three garbs Or. 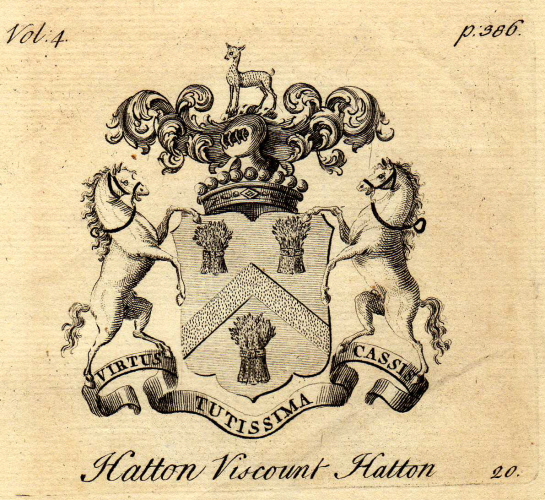 Christopher Hatton, 2nd Baron Hatton of Kirby, was created Viscount Hatton of Gretton in 1682. The title was inherited by his eldest son and then by his youngest son. The title became extinct in 1762 on the death of the latter. Arms: Or three morions per pale Argent and Azure banded Gules. 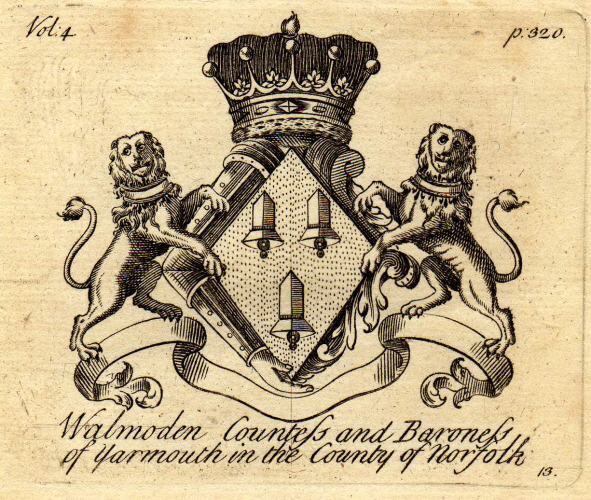 Amelia Sophia de Walmoden, Mistress of King George II, was created Countess of Yarmouth for life in 1740. She was the last Royal mistress to be so honoured. She died in 1765. Arms: Quarterly 1st and 4th Argent a human heart Gules imperially crowned proper on a chief Azure three mullets of the field (for Douglas) 2nd & 3rd Azure a bend between six crosslets fitchy Or (for Earldom of Mar) all within a bordure Or charged with a double tressure flory-counter-flory Gules. Crest: A human heart Gules ensigned with an imperial crown between two wings Or. Supporters: On each side a Pegasus Argent winged maned and hoofed Or. The Dukedom was created in 1708 in the Peerage of Great Britain for James Douglas (1672-1711), 2nd Duke of Queensberry (Peerage of Scotland). 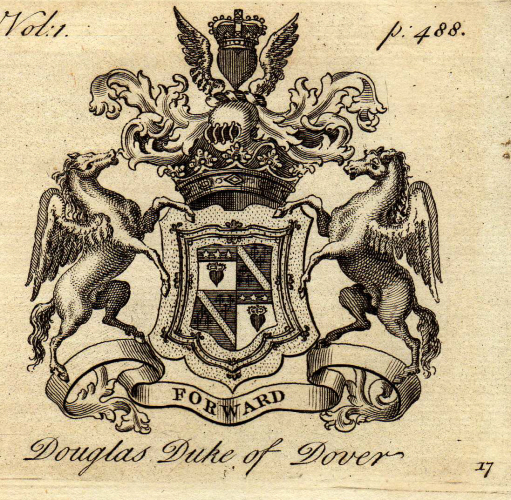 The Dukedom expired in 1788 on the death of the 2nd Duke, Charles Douglas (1698-1788) 3rd Duke of Queensberry. Edward Kenrick Tighe (1862-1917) married Viola Lilian Henriette, daughter of of Edward Skeffington Randal Smyth of Mount Henry, Queen’s County, Ireland. Fownes: From Edward’s great, great grandmother Sarah Fownes, daughter and heiress of the Rt Hon Sir William Fownes 2nd & last Baronet, who married William Tighe (1738-1782). Bunbury: In 1872 Edward’s grandfather, Daniel Tighe, assume the additional Name and Arms of Bunbury by Royal License. Daniel’s mother was Marianne Grahan and her mother was Hannah Bunbury, sister and co-heiress of Matthew Bunbury of Kilfeacle, Tipperary. 3rd Quarter: These Arms seem to be for Lucy but I have been unable to find any family connections with Tighe. 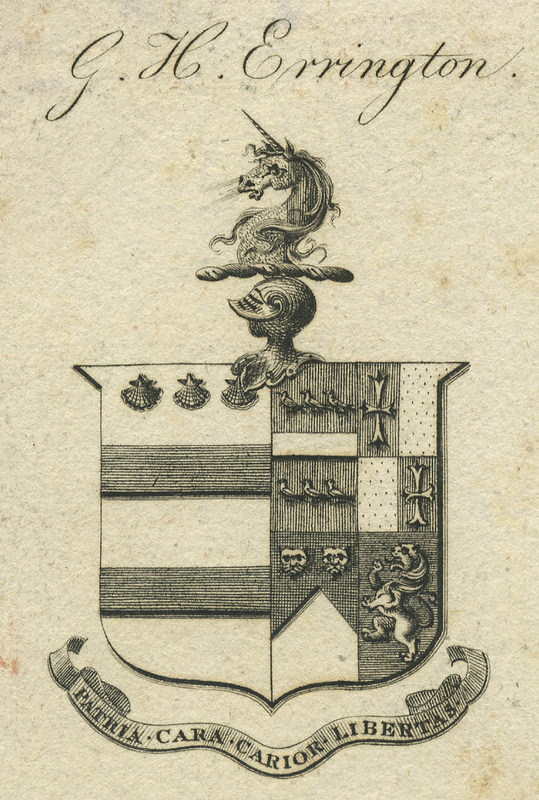 However, the bookplate for the Rt Hon William Frederick Fownes Tighe (Edward’s great uncle) is recorded as including quarters for Borr, Fownes, Sweet, Grahan and Bunbury. 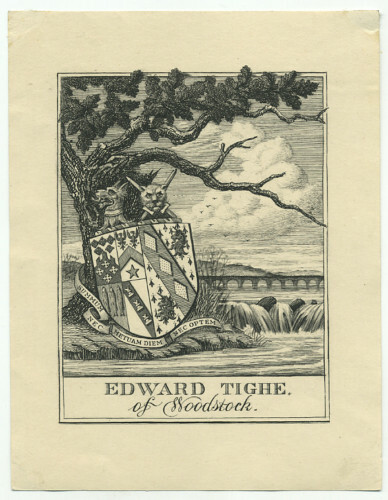 Update: Anthony Pincott kindly sent me a copy of W F F Tighe’s bookplate which has the “fish” in the Gahan quarter. Arms : Argent two bars in chief three escallops Azure. Crest: A unicorn’s head erased per pale Argent and Gules. The most likely candidate is George Henry Errington (b.1777 d.1843) of Cotton Hall, North Stafffordshire. He married Elizabeth Sophia, daughter of John Crosse Crooke of Kempshot Park. George Henry was the son of George Errington of Chadwell Hall and Ashbourn, co. Derby. * My thanks to Charles Ross who pointed me in the right direction.